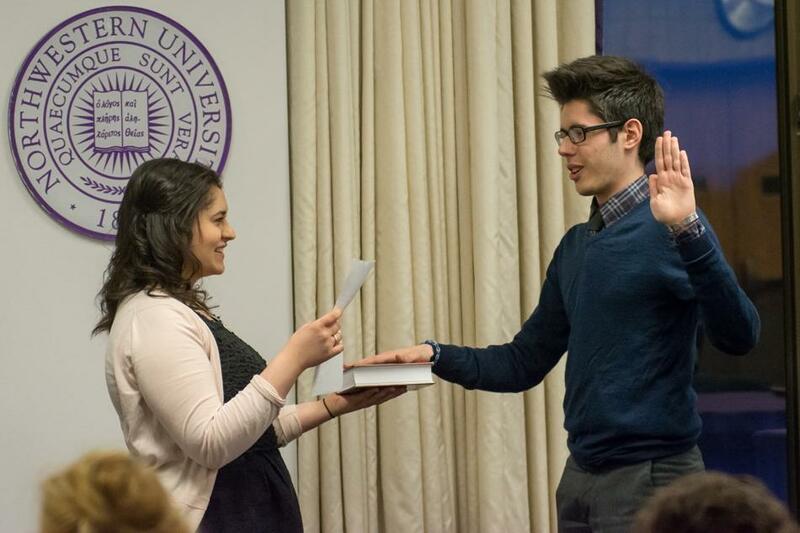 McCormick senior Abby Klearman swears in Weinberg junior Petros Karahalios as the Associated Student Government parliamentarian for the coming year. Klearman served as parliamentarian the past year. Associated Student Government discussed legislation on Wednesday night regarding taking formal action to improve resources for sexual assault victims at Northwestern and implementing stronger prevention methods. The amendment included a three-week deadline by which the ASG executive board will be required to report back to Senate with an outline of specific actions it plans to take to promote activism. The legislation also addressed past laws created regarding sexual assault and included national statistics about the prevalence of sexual assaults on college campuses in an effort to emphasize the importance of these issues in a national forum. “Obviously, it’s been a pertinent issue here on campus. We’ve seen some passionate students about it, and there are a number of students who kind of already deal with this issue on campus,” said Kevin Harris, community relations vice president. Members of the ASG executive board have been working with several students over the past few months who are spearheading protests in response to the lawsuit filed by a Medill junior against the University, said ASG president Ani Ajith. He emphasized ASG should serve as the facilitator for these programming efforts, including taking actions such as booking rooms and gathering students and faculty. Harris added this legislation is the “first step” in formally talking about how to prevent sexual assault and to guarantee students understand their rights under Title IX of the Education Amendments of 1972. Members of Senate emphasized the importance of making this issue a priority. Senate fast-tracked the proposal, moving it from new business to old business and immediately voted to pass it. Senate also swore in the new speaker and parliamentarian, two positions which were nominated and elected at last week’s meeting. Weinberg sophomore Noah Star assumed the position of speaker, and Weinberg junior Petros Karahalios now holds the position of parliamentarian. Three groups were awarded the Community Engagement Grant, a program focused on improving NU’s relationship with Evanston through community service projects. The groups allotted the grant included Supplies for Dreams and NU Mini Chefs. The NU “Hackathon” IT design competition, a programming event held to improve NU’s current technology services, was also explained. ASG representatives who traveled to Washington, D.C., over the weekend to lobby several members of Congress from Illinois gave a short debriefing of the experience, noting they plan to continue working with government officials at a national level.